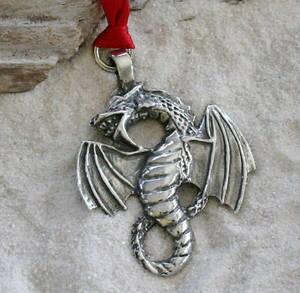 This detailed Dragon Ornament is handcast and hand-finished in solid American Pewter with a shiny finish resembling antiqued sterling silver. This unique Holiday Ornament comes with a Red Satin Ribbon ready to hang from your Christmas Tree or as a Holiday Decoration for your home. They also make terrific gifts...you and your loved ones can enjoy this lovely keepsake for years to come! Length including loop: 2 1/4"
Dragons are mystical creatures that hold a major spiritual significance in various religions and cultures….a timeless symbol of Immense Power. Representing the Primal Forces of the Universe…Wisdom and Longevity…they possess Magick and Supernatural Powers.